Once the sun rises on Saturday morning (if at all, given the weather forecast), the five tunnel bus routes with weekend trips will find themselves on their new surface alignments through downtown. Other changes to dozens of routes, as well as the implementation of all-door boarding on 3rd Avenue, will also take effect on Saturday. The full rollout of ORCA readers at 3rd Avenue stops will still take a few more months, so Metro will redeploy the tunnel boarding assistants at surface stops with their handheld readers to scan ORCA cards. The now train-only tunnel will re-open at 5 a.m. and operate with the usual frequency, though reliability improvements and other differences will take time to notice. In the meantime, transit fans can also appreciate an adaptive re-use of another landmark with the grand opening of ARTS at King Street Station. The city-run program will convert the third floor of the station, previously slated for a street food market and other ideas, into an art gallery that is open to the public. The inaugural program is a showcase of indigenous artwork from various parts of the Pacific Northwest, which will run until August. On Sunday, March 24, Community Transit will open its new Swift Green Line, the second bus rapid transit line in Snohomish County. The Green Line travels just over 12 miles from the Boeing Everett Factory and Paine Field in the northwest, through Mill Creek on State Route 527, and to Canyon Park in northern Bothell. Buses will run every 10 minutes on weekdays and every 20 minutes at other times, and provide transfers to the Blue Line as well as other Community Transit routes. The opening celebration, including music, food trucks, caricature artists, giveaways, and activities for children, will take place from 11 a.m. to 2 p.m. at McCollum Park in Everett. U.S. Representative Rick Larsen, County Executive Dave Somers, and State Senator Marko Liias will also be speaking at the event. The first ride will depart with VIPs at 12 p.m., with later buses running on their usual schedule. McCollum Park is accessible by the Green Line, as well as route 105, which functions as a local “shadow” along the entire SR 527 corridor. Route 109 is the best option for those coming from Sound Transit Express Route 512, departing from Ash Way P&R every hour on Sundays. Celebrations begin at 11 p.m.? And who’s autograph? The Breda? 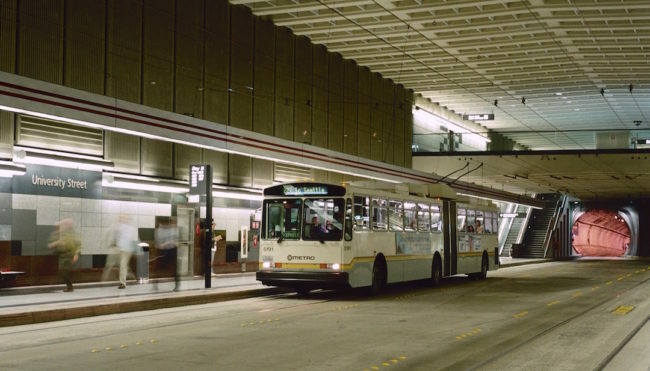 I was in about 1st-2nd grade when the tunnel opened, and was so excited when my parents took me downtown to ride in the Seattle “subway” for the first time. It seemed so futuristic and big city, and while many people complained about the Breda’s, I really liked that they felt “cooler” than the American made buses (being Italian, it made them seem so fancy in my mind). We walked around each station carefully and had a lot of fun looking at the artwork. My dad worked closer to Westlake, and I remember he thought that this would give him much better access to ID lunch options. These stations, despite being 30 years old, IMO are vastly better in function and much more attractive than the newer Link stations such as Capitol Hill and UW. I hope ST3 does not mess these existing stations up and merely links conveniently into them. They’re integrated much better with the environment, maybe too well. They can be easy to miss. The worst offender by far is Roosevelt Station, which will have two blocks of blank wall and nothing on top. Ludicrous for such a deep subway station. The lack of center platforms in the old stations is not a plus, but they are still beautiful. These days, I only use UWS and CHS for my commute, and I really love those stations too…they have met my daily needs perfectly. And so many people have been complaining about the DSTT stations. Capitol Hill looks standalone because there was a delay in building the buildings. UW is standalone because the university wouldn’t allow it to be built anywhere else on campus, most notably undergrond below the HUB. As for Roosevelt, it sounds like you’re blaming Sound Transit for the City of Seattle’s zoning. Mike the collossal size of Roosevelt’s above ground infrastructure and the lack of support for building on top of said infrastructure has nothing to do with zoning. It is entirely due to cost cutting on ST’s part. There was a quote somewhere a few days ago that the maximum allowed building was around 1-2 stories above the station. Developers don’t get excited about 1-2 stories. Look at all the unchanged buildings in lowrise lots where developers think it’s not worth it just to add one or two stories compared to the existing buildings. Seattle was way late with its rezoning, a whole half-decade after the major station specs were set in stone. ST could not plan for possible future zoning that might not happen; it had to plan based on the existing and almost-approved zoning at the time. And Roosevelt was distinctly low-rise then. They were arguing about whether single-family houses should be preserved one block from the station; whether development should not obstruct views from Roosevelt High School because the views were critical to students’ well-being; and a determination to prevent the Sisley slumlord from making a killing on tall buildings. The upzone that finally went through was a moderate improvement, better than it looked like it would be during the process, but still half as much as its potential could have been. I’m not sure what the zoning has been historically at the station site but if you look back at the archives here the update to the Roosevelt neighborhood plan took place well before even 10% engineering had been done on the station. The station site has been zoned for 85’ ever since then. And MEHVA has an original dual power Breada in their historic bus fleet? It’s not one that was later converted … had their diesel engines taken out, and used just as a trolley-only bus? The Bredas used the overhead when they were in the tunnel. That is gone now. Their engine is an old Detroit 2 stroke. It will be interesting. It will be historical, but it will also be loud. Others can enjoy. Please take loads of pictures. I have to save $$$ for a new camera and to take a trip on BART/MUNI/Capitol Corridor. I’ll miss you at the opening. I’ll think of you at the Seaview Transit Center. Don’t expect a lot of pictures. Is there anything part of this that will mean all motor vehicles will be removed from the tunnel including police, supervisors, etc? Such as no north turnaround point? Reduced ventilation? New center of roadway fencing? I don’t know anything official, but driving the 150 last night and last week, I’ve noticed a lot of new pavement markings around the lanes. Last night, they pretty much followed the lanes themselves. I’m thinking they will dig up or modify the center lane in each station. I’m on the South Base night extra board. I’m kind of hoping to be assigned the 150 nightowl on Friday night which I’ve been assigned other days the last month. I could be the last 150 both directions through the tunnel…. After crowing about it for months and months, leave it to Metro and the city to not have the third avenue readers ready. Hilarious. Let’s hope the rest of the changes go better as we discard this important piece of bus infrastructure. All the places on 3rd where Metro employees scan rear doors for fares might end up being a short term fare enforcer. No scan. No ride. No argument. Let’s see how it works. As far as speed goes. It worked in the tunnel during rush hour very well. I am going to miss it till 2021. This is off topic. I haven’t seen Mark Dublin comment in a while. Is he ok? Just checkin. Good point, I don’t know. I didn’t see him at the meetup. Why is it that every time there’s a service change, the new schedules are hidden on Metro’s website until the change goes into effect, even when the new paper timetables are already available on board the buses (so the new schedule must be finalized). I understand the need to continue to post to old schedule as long as its still being used, but why is it so hard for them add a link to the page with the old schedule, pointing to the new schedule. This makes trip planning needlessly more cumbersome than it needs to be. They are not hidden, it is on the service change page, on the left side. Community Transit does it best: there’s full previews of the new schedules that are clearly labeled as such. Also printed pamphlets on board buses. I’m going to the Swift Green opening if the Sunday date and hourly CT service don’t wear me down. My plan is, after the VIPs leave, to take the Green westbound to Seaview TC, then east to Canyon Park. Afterward I may take (A) the 105 to UW Bothell and the 522 home, (B) may take the Green to Mill Creek and the 116 to Lynnwood TC and the 512, or (C) the Green to the Blue and E. It will depend a lot on which option avoids a 30-45 minute wait somewhere. Community Transit’s hourly service, you kill me, it reminds me of growing up in Bellevue in the 80s and having to make these calculations all the time. I wish the opening weren’t on a Sunday, and that more of the planned 15-minute and Swift corridors will become a reality soon. I’ll be sure to bring printouts of the 105, 109, and 116 schedules. Is there a FB event or other info page for the festivities tonight? I found the one for Swift Green opening, but not for the tunnel closing. Metro posted it on its blog this evening. So how many rode the last Breda? Did they require additional coaches due to the turnout? About 60 people rode the Breda. Maybe six coaches in all. Fun was had by all!